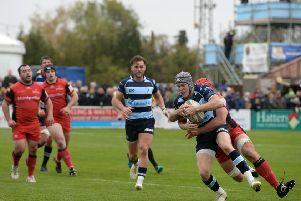 Bedford Blues will be looking forward to a return to Goldington Road as they prepare to take on Rotherham Titans under the Friday night lights. The Blues went down 34-27 during a back and forth game in Jersey last Saturday, but more concerning were the number of injuries that were picked up during the encounter. Michael Le Bourgeois, Sam Blanchet, Ollie Dodge, Camilo Parilli-Ocampo (all concussion), Henry Taylor (ankle) and Phil Boulton (back) are all ruled out of action for Friday’s game. Looking ahead to Friday’s encounter, Blues backs coach Paul Larkin said: “Despite the obvious setback with injuries, the lads are really upbeat and looking forward to getting out on the pitch. Tom Griffiths will make his Bedford Blues debut on Friday night as he starts at inside centre while Alex Lundberg gets his first start in the front row following three replacement appearances and Biyi Alo pulls on a Blues jersey for the first time as he is named on the bench.